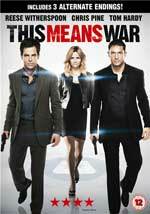 I know the exact moment when I gave up on the idea that This Means War was going to be a good movie. Fairly early on Lauren (Reese Witherspoon) is shopping with her friend, Trish (Chelsea Handler), a character who only exists to give Lauren an excuse to say exactly what she’s thinking at any point in time. After several years of development difficulties, The Necessary Death of Charlie Countryman is finally moving forward with Shia Labeouf in the lead role and Fredrik Bond directing. Now Variety reports that Melissa Leo and Til Schweiger have joined the cast. Shia LaBeouf stars as the title character, who falls for a young woman (Evan Rachel Wood) under the control of a violent mob boss (Mads Mikkelsen). Melissa Leo will play Charlie’s late mother, whose spirit guides him through this ordeal. Til Schweiger is portraying Darko, a Serbian mobster who is sent to America to avoid a war crimes tribunal. Fredrik Bond is directing from a screenplay by Matt Drake (Project X), with production scheduled to begin next month in Eastern Europe.